Historical records suggest that Diastella buekii was once common in the area between Paarl and Franschhoek. This enigmatic species is now confined to a few small isolated remnants, and is one of the top priority species for conservation in the area. Diastella buekii is a most attractive prostrate mat-forming shrub with trailing hairless branches. Plants can reach a diameter of up to 5 m. Leaves are bright green, needle-like, 10-25 mm long and 1-2 mm wide. Flowers are plush pink, turning lighter pink towards the end of the flowering period. Flowerheads are solitary, star-shaped, 10-15 mm in diameter and nestled among the leaves. The fruit is an egg-shaped nut released 1-2 months after flowering. Diastella buekii is listed as Critically Endangered. Only four subpopulations of this species remain, and it is still severely threatened by agricultural development, mining and alien invasion. The estimated number of individuals remaining is 700. Due to agricultural activities, most of the habitat type of the species has been destroyed; only a few isolated remnants still exist. None of these remnants has any formal conservation protection status. One of the sites where this species is found is a declared National Heritage site but this status does not provide sufficient conservation protection for the species. Currently a process is under way to transfer land from the Forestry Department to Cape Nature to be included in the network of protected areas. Other potential threats to the remaining populations include afforestation, road verge clearing and water table depletion. 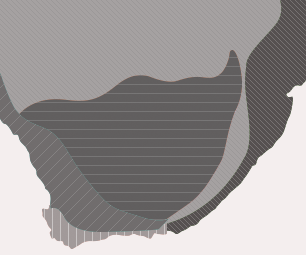 Diastella buekii occurs on low lying sandy flats with a high water table, between Wemmershoek and Franschhoek. 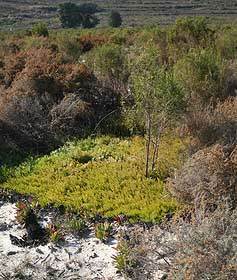 The main vegetation type where this species is found is Swartland Alluvium Fynbos. This vegetation type is listed as Critically Endangered, and is characterised by undulating plains with a mix of low evergreen shrubs and the presence of sparse tall shrubs. Proteoid, restioid and asteraceous fynbos is dominant. More than 75% of this vegetation type has already been transformed by man. The species favours the wetter low-lying areas and grows in association with other highly threatened species such as Watsonia distans, Erica alexandri and Erica bakeri. The genus Diastella is from the Greek diastellein, to separate (referring to the free perianth lobes). The specific name buekii is after H.W. Buek (1796-1879). The genus consists of 7 species and is endemic to the south-western corner of the Cape. 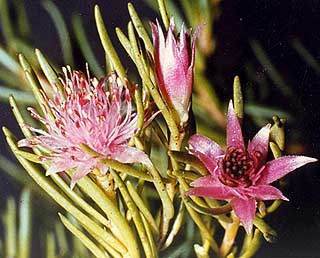 Diastella is often confused with Leucospermum, but the key diagnostic character is the four free perianth segments. Diastella buekii was assumed extinct when the genus was revised in 1976 by Dr John Rourke. At that time the last known collection was from 1934. The species was rediscovered by Mr A.V. Milewski from the Bolus Herbarium. Little is known about the biology and ecology of the species. It is a re-seeder which means it survives fire by regenerating from seeds. Seeds are dispersed by ants. The species prefers damp sandy soils, and populations are negatively impacted if the ground water levels become very low. Diastella buekii can be grown from seed, but propagating from cuttings has been more successful. Cuttings, preferably tip cuttings, are collected between November and March. They are treated with a rooting hormone and placed in shallow trays on heated beds with mist/fog irrigation in the nursery. The rooting medium consists of fine bark and polystyrene pellets. 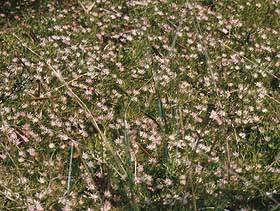 Diastella buekii has great potential as a ground cover because of its spreading habit. Cape Nature, ISEP file material. Jonkershoek, Stellenbosch. Unpublished. Manders, P.T. 1989. Experimental management of a Pinus pinaster plantation for the conservation of Diastella buekii. South African Journal of Botany 55(3): 314-320. McDowell, C.R. 1993. Wemmershoek Vlei, Franschhoek: An analysis of flora, hydrogeology and likely impacts of pines, with conservation recommendations. Botany Department, UCT, Cape Town.